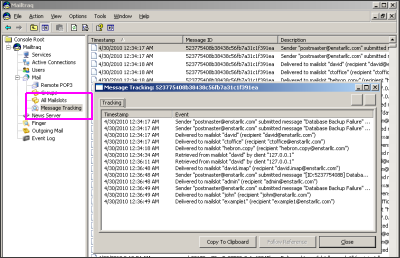 Message Tracking, available in the MMC Console is a powerful tool that enables an Administrator to easily discover what has happened to a message handled by Mailtraq. The tracking system is accessed from the left-pane tree-view under the Mail section. Select a message to track, then right-click to display the detailed tracking information. Tracking information is retained for about one week. Users have direct access to Message Tracking from their webmail account. This feature can greatly reduce the Administrator's work-load as users can discover for themselves what has happened to a message. 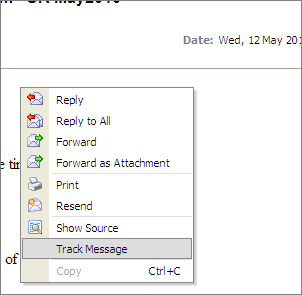 Tracking information is displayed by opening a message in the webmail 'Sent' folder, then right-clicking and selecting 'Track Message' as shown. The illustration shows EWA - Enhanced Web Access - webmail. The same options are available in Standard WebMail from the main button bar. Message Tracking is not available if the Advanced Outbound Router is enabled.